~Click on the above link to view new data posted on this site. ~Quote by Tom Brokaw, Spring of 1994: During the coverage of the 50th anniversary of D-Day, I was asked...my thoughts on what we were witnessing. As I looked over the assembled crowd of veterans,.....I said, "I think this is the greatest generation any society has ever produced." Feel free to SUBMIT the above type of information about Iowa ServiceMen and Women to Coordinator, Linda Ziemann. Search Suggestions--Use the above search engine IF you know the surname of the service person you are seeking. Because of the large amount of surnames on this website, the suggestion for using the specific County Indexes is most advisable. If you know the county that the serviceman hailed from - consider using the side panel county links on this main page. The side county links have surname alphabetical indexes for the men. There is also an index in the panel below for the service women of Iowa. Iowa Daily Press War Correspondent, FRANK MILES -- Read his news coverage mentioning those serving from IOWA. Letters Written by Iowa Service Men & Women -- Quite detailed -- somehow got passed the Censors. More Main Index Topics - Don't miss these additional links! Surnames: County INDEX of SERVICE MEN per county--includes photos, news items, family data, bios, obits, etc. 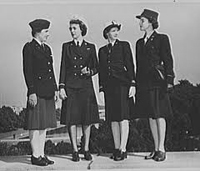 Surnames: County INDEX of SERVICE WOMEN (below) includes photos, news items, family data, obits, etc. Records of the state historical department show that the death rate among Iowans killed in World War II is highest for Emmet county, closely followed by Adams county. A total of 7,213 have given their lives for their country in World War II. This is more than twice the number killed in World War I. The total then was 3,578. For every thousand persons in Iowa, the number who have given their lives in this war now stands at 2.76. The total number dead in O’Brien county is 48 or 2.4 per thousand population; in Sioux county, 55 killed or 2.0 per thousands population; in Lyon county, 28 killed or 1.8 per thousand population; in Osceola county, 24 killed or 2.3 per thousand population. Thanks also to everyone who is contributing to this website. Please keep your stories & photos coming! Please consider adding additional photos & data to any existing page/s you find on this website for your family WWII Iowa veteran. Don't miss the Tribute to Contributors page link. Space for Iowa in WWII Special Project is provided by IAGenWeb. ~Iowa in WWII logo & the footer Stars image & the State specific logos designed exclusively for IAGenWeb by Sharon R. Becker, Assistant Coordinator for this website~Dec 2012. Iowa in WWII Special Project contents have been willed to IAGenWeb.